Ferry on the rocks, originally uploaded by captainjay. 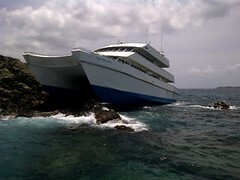 Well apparently a ferry leaving St. John last night after the fireworks heading back to St. Croix, ran up on the rocks at Great St. James. 98 passenger and four crew had to be transported to St. Thomas. The 5 injured were transported to Red Hook where emergency medical service personnel were waiting. The other passengers and crew were taken to the Winward Passage hotel. The accident is under investigation.